Net product price: 15,51 грн. Gross product price: 18,61 грн. Used in agricultural machinery CLAAS (Dominator harvesters, Jaguar forage harvesters, Corto mowers) for fixing parts in a hole 110 mm diameter. Net product price: 22,77 грн. Gross product price: 27,32 грн. Used in agricultural machinery CLAAS (Dominator, harvesters, Jaguar forage harvesters, Quadrant, Quantum, Sprint balers) for fixing parts in a hole125 mm diameter. Net product price: 31,02 грн. Gross product price: 37,22 грн. 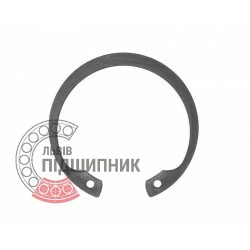 Net product price: 0,66 грн. 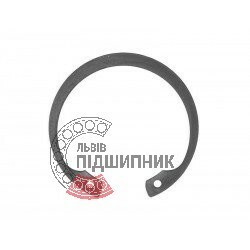 Gross product price: 0,79 грн. Net product price: 33,00 грн. Gross product price: 39,60 грн. Spring snap rings are used for axial fixing of details on the bores and shafts. They are widely used in mechanical devices for axes fixation, rods, levers and bearings. By the way of mounting snap rings are divided into inner, inserted into the bores - GOST 13943-86, GOST 13941-86, DIN472 and outer, put on the rotation shaft - GOST 13942-86, GOST 13940-86, DIN471. Inner eccentric spring snap rings prevent displacement of details, outer - are used for fixing of spare parts on the shafts and bearings. On our website you can buy snap rings (inner and outer) at a reasonable price. Order snap rings via online ordering system and via landline or mobile phone. If you have any questions, please feel free to contact us. Always glad to help you.